The fall tradition of heading to the apple orchard to pick your own fruit continues on well past childhood, and true to form, it is always that one really hot day. 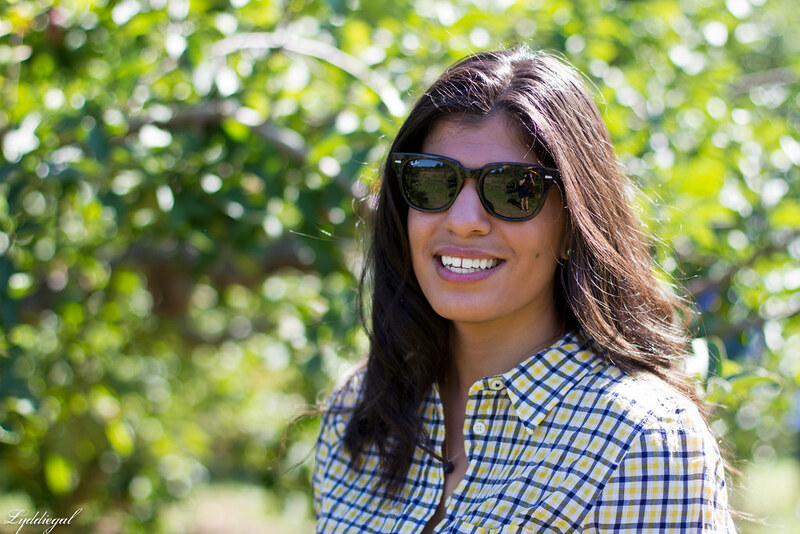 Thankfully I've learned from past mistakes and wore shorts; I did not look with envy at my fellow apple pickers trying to embrace fall fashion in jeans and boots. I really love apples, and even more so, apple pie. Looking forward to baking one this weekend! I love apple picking! great choice of outfit,comfortable and chic love it! I've actually never done this before but it looks like fabulous weather. And you look gorgeous, as usual! Such a cute look and smart for wearing shorts! When I went a couple years ago I wore a skirt with boots (and no tights) haha. Apple pie is my favorite and I'm dying to go apple picking. Every year we say we will but it doesn't happen, but this year I really really want to! Yay for fall apple flavors! You look so cute in your jean shorts. These pictures are adorable! Love your top! I love apple picking and just went a couple weeks ago:) I love your cute and casual look! Those yellow flats are adorable. Super cute look! We have plans to go to the pumpkin patch this weekend but I hear rain is in the forecast, ugh! 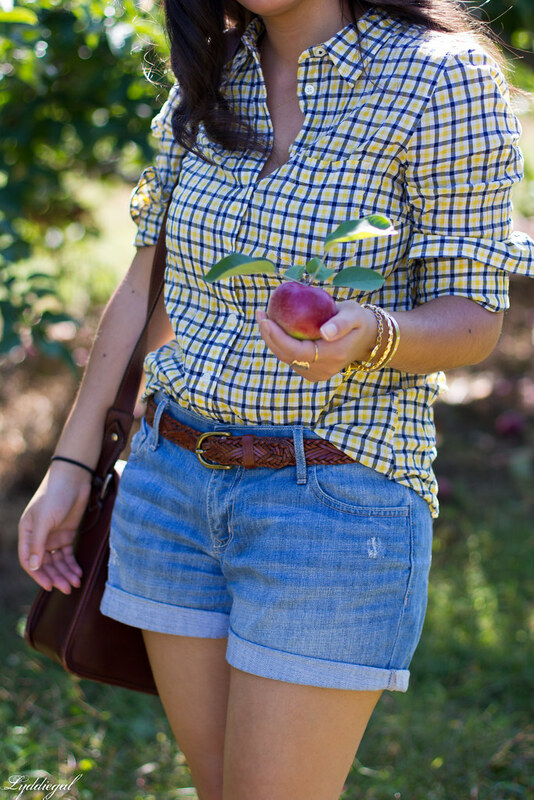 Such a perfect outfit for apple picking - I love the top! A very apple-picking appropriate attire, while still looking stylish! Hah, love that you knew to dress appropriately! Is that one of those law of natures where on the day you want to be the MOST fall-like, it's completely hot? I feel like that always happens when I'm apple picking! How fun! 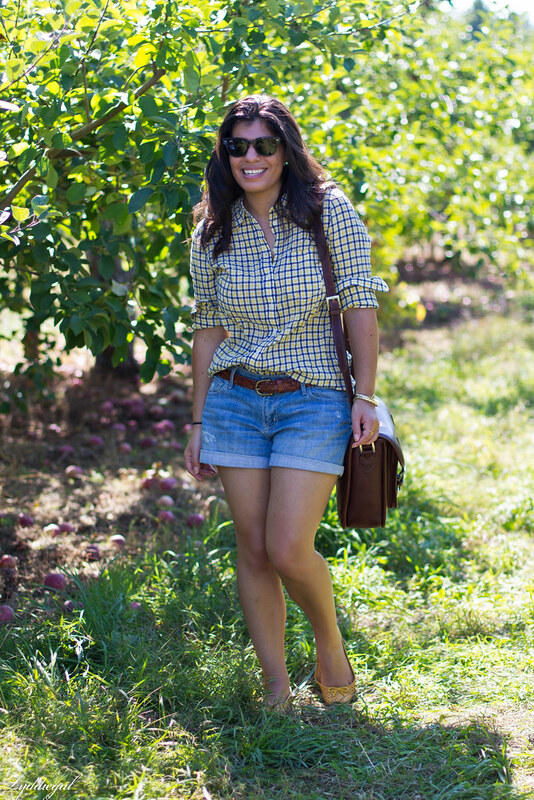 I love going apple picking and you picked the perfect outfit for it! You look SO good! I wouldn't know what to wear applepicking but this is perfect! 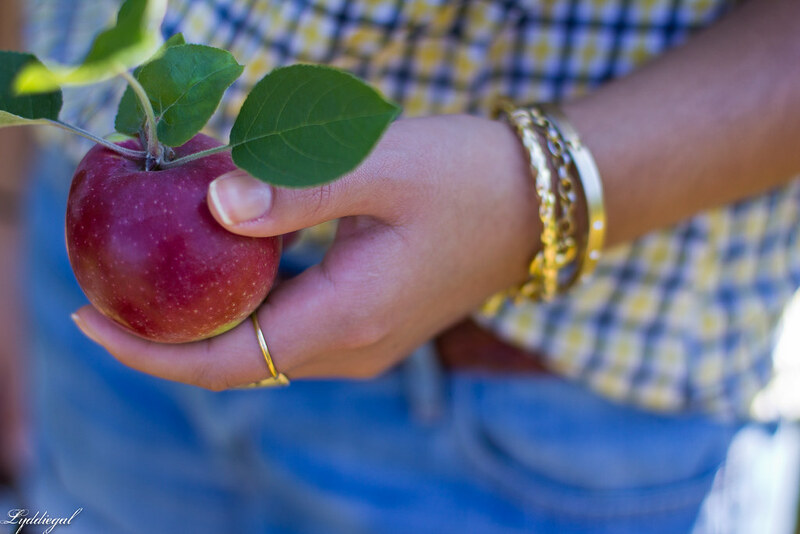 There's nothing better than eating an apple right off the tree. So fun!! Loving your plaid top. The colors are so perfect!! this is such a cute outfit! I love your top! I love apple picking in the fall! I wish it was that warm when I went with my daughter! I am just hoping we have a chance to go again before we have our first frost! I can't imagine how the denim and boots people lasted apple picking. It looks like you enjoyed a beautiful day-both re weather and activity. Your outfit is so cute and cheery! Love the little check shirt! You know, I think I've only been apple picking once or twice. I think it would be fun, but I wouldn't know what to do with all the apples-- I don't actually like apple pie (I've never liked cooked fruit) so I'd probably have to make... apple cider? Smart move on the shorts--may as well wear them while you still can! I love that first pic, it's too cute! Can you believe I've never been apple picking...crazy! Lydia, you look so cute doll! I love your shirt. The colors are so pretty! Great shorts and belt. I love orchards. Have fun baking this weekend. Sounds good. I have never been apple picking actually, and would love to one day...although I don't like apples, but love apple pies. Yeah, I know -- strange! 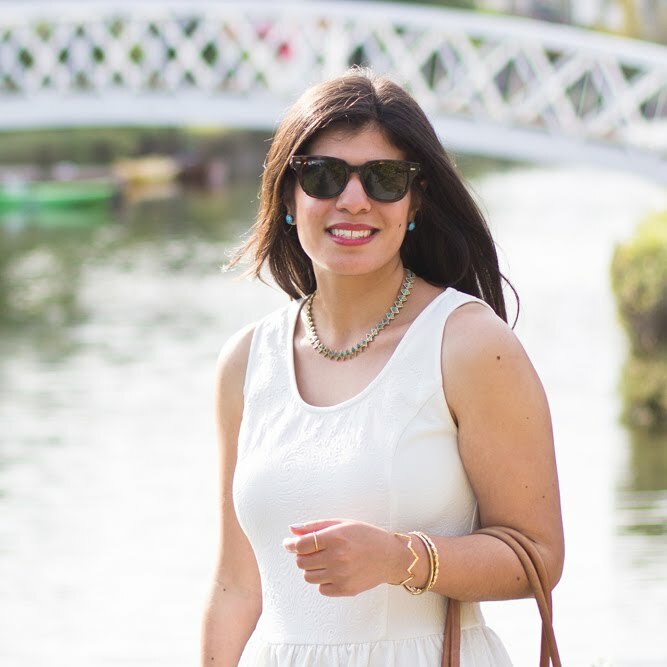 Your outfit on the other hand is quite simple and chic for the event. the plaid and denim together are great! 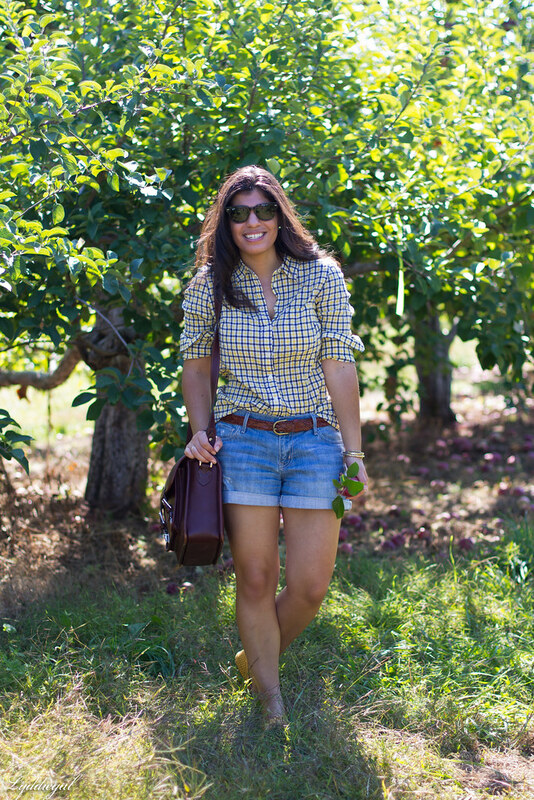 The plaid top is perfect for a day of apple picking. I really need to go apple picking one of these days. What a wonderful fall tradition. Love your outfit! Fantastic casual look! I adore the color combination of your shirt! You are too cute!! Love thst blouse! I wish there was a place to go apple picking around here! So much fun!! You look lovely dear! I hope you got to make your pie! Oh I wish I could go to an apple orchard, that would be awesome. I picked apples once it was in Chile. I guess I will just have to settle for picking up free mangos off the grass in front of my apartment building.. I like how this turned out.. specially the shirt.